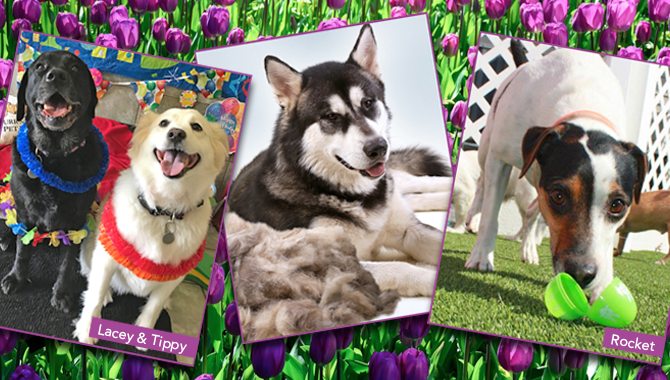 Spring has sprung at Purr’n Pooch Pet Resorts and spring break is almost here. Remember to make your reservations now for vacation. Fun times will be blooming with our birthday party and Easter egg hunt this month. Spring into our birthday celebration this month. Help us celebrate our daycare friends born in April. Pictures will be posted on Facebook after the party. Saturday, April 13 ~ 11:00 a.m. – 1:30 a.m. The Easter Bunny is stopping by and leaving treat filled eggs for all the dogs who come in for daycare. Spring is here and so is shedding season. FURminator deShedding shampoo can drastically reduce shedding. This shampoo and conditioner can be used on long and short haired dogs and cats to improve skin health and hair growth and adds elasticity to the hair shaft to reduce shedding. Pricing depends on coat condition and size of pet. Call either location for an approximate price for your pet. Agility for Fun is a “fun” way to build a working relationship with your dog. It provides both physical and mental exercise for your canine companion. In this class your dog will learn to be directed to agility obstacles such as a tunnel, jump, A-frame, or tire jump. Dogs of all ages can participate in this class. Woohoo! Spring will be here on the 20th! Fun times will be marching into Purr’n Pooch this month. 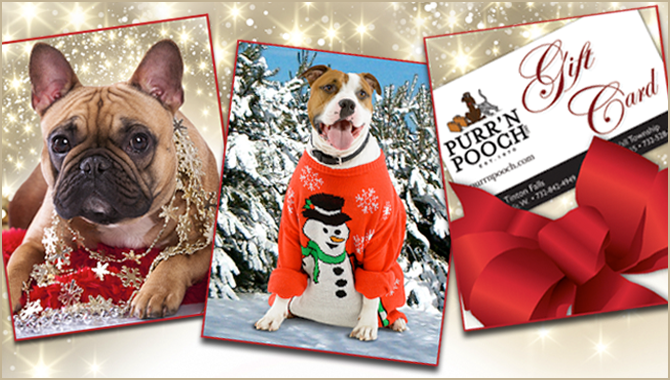 We have lots of fun things for our furry friends this month. 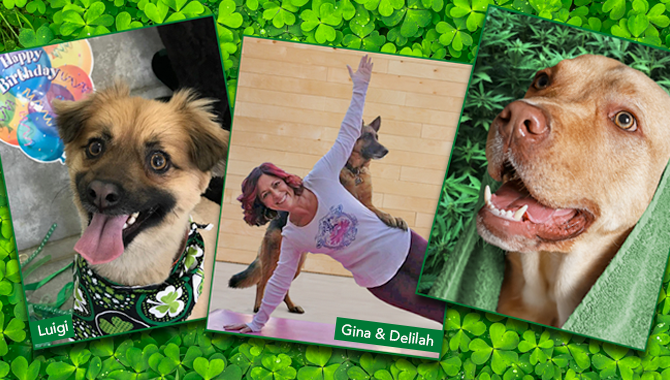 St. Patrick’s Day themed birthday parties, doga classes, and Hemp Happiness spa special. We will be partying in daycare in both resorts to celebrate Mardi Gras. Everypaw is a lil Irish during our St. Patrick’s themed Birthday parties. Help us celebrate our daycare friends born in the month of March. Pictures will be posted on Facebook after the party. Hemp shampoo helps dry, itchy skin while preserving existing hydration. Spa package includes shampoo, fresh smelling spritz and teeth brushing. Cost is $18 plus price of bath or grooming. 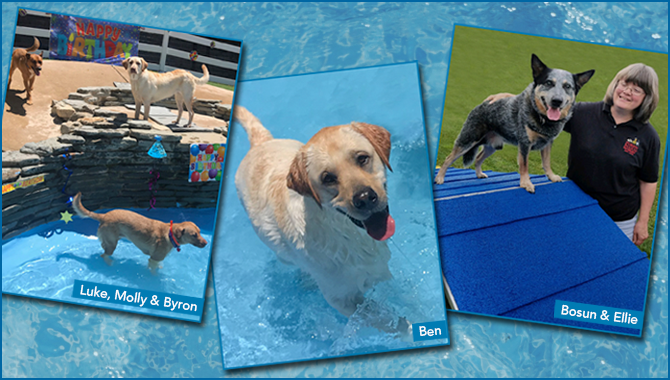 Pamper your pet with a special treat during their next vacation with us. Perfect after a day of play! $5 per treat. Learn how to incorporate your dog into your practice. Yoga can be calming experience for both you and your furry best friend. No prior yoga experience needed. Email info@purrnpooch.com with questions or to sign up for class. February is FURLOVE. 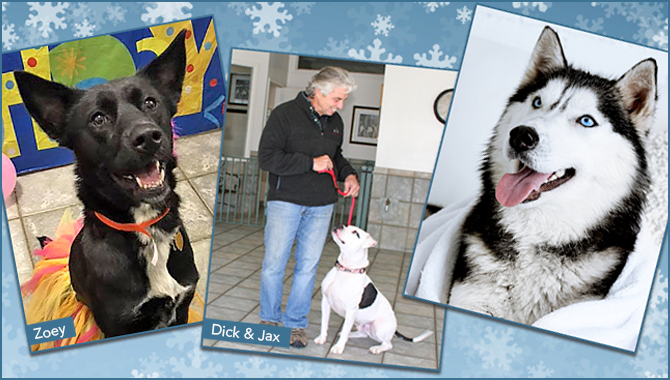 We have lots of fun things for our furry friends this month. Valentine’s Day themed birthday parties, strawberries & chocolates spa specials, and our new monthly fitness feature. Love is the main focus of our Valentine’s themed Birthday parties. Help us celebrate our daycare friends born in the month of February. Pictures will be posted on Facebook the next day. Submit photos on February 19 to info@purrnpooch.com . An album of all the photos will be posted on February 20 on Facebook. Voting will end 11:59 p.m. on February 20. 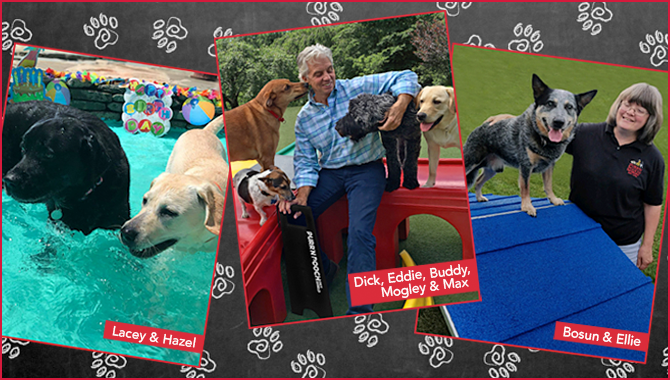 The pet whose picture receives the most likes will win 1 free night of luxury boarding and playtime. Our February spa package includes strawberry milk bath moisturizing shampoo, enriched with milk proteins for healthier skin and coats, with cocoa spritz, and teeth brushing. Cost is $18 plus price of bath or grooming. October is the time of year for long walks with your pet looking at the leaves changing colors and smelling the delicious scent of pumpkin spice. 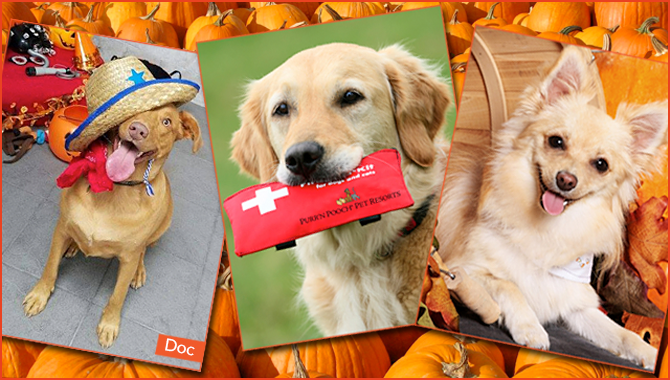 Purr’n Pooch will be hosting a Pet First Aid & CPR class in honor of National Animal Safety and Protection Month. This class is very informative and can benefit any pet owner or pet professional. We will have two parties in October for our daycare guests: our monthly Birthday and our annual Halloween Costume Party. Party games will be enjoyed and pictures will be taken on the playground. Come help us celebrate our daycare friends born in the month of October. Photos will be posted on Facebook the next day. Saturday, October 20 ~ 10 a.m. – 12:30 p.m. The Pet First Aid & Pet CPR course is a certification course through the American Safety & Health Institute (ASHI). The course runs about 2 ½ hours and consists of training in rescue breathing, pulse check and chest compressions. We cover emergencies such as bleeding, shock, fractures, heat and cold emergencies, poisoning, drowning and much more. Students will receive a student manual and basic first aid training kit. Bring your pet’s Halloween costume to daycare. We will dress them up for the party and have a scary good time. The pet with the most creative costume will win a free day of daycare. Refer a new client to us and once they register you will receive a $5 coupon towards your next visit. Coupon can not be used for retail items or combined with any other promotional offer.